Ms Anna will have face painting, a booth with original artwork, and a fantasy photo booth for you to snap photo's with friends with amazing face paint designs! Come to ms Anna's studio to see her new work, buy prints, buy one of her two self published children's stories, and to get your face painted (all ages welcome) and, special for April 2015, get your picture taken making a SillyFace to be part of Ms Anna's Art Installation along Halsted in the Seven Podmajersky Pods!! Come by Ms Anna's studio every second friday for face painting, juice, cookies, and amazingly whimsical art. I will be reading my first book, Everybody Can Hula Hoop But Me... as well as will be offering copies of the book on a sliding $5-$15 scale for this event only. Here is a link to the 4pm Event https://www.facebook.com/events/1507846019467445/ You must RSVP to attend. I will be reading my first Book, Everybody Can Hula Hoop but me... during both the 1pm and 4pm performances. You must RSVP to attend. Here is a link to the facebook event https://www.facebook.com/events/1499561056988107 with the address and more information. Ms Anna will be face painting holiday designs for shoppers during the event. Anna's cart will be roving and will also include several copies of Ms Anna's new baby board book SillyFace. Ms Anna's second book, SillyFace, will be available at her official release in her booth at this years DIY Trunk Show at the Chicago Armory. Ms Anna will also be offering facepainting for guests as well as offering other goodies like her first book about the only girl in the world who can not hula hoop: Everybody Hoops but me. Ms Anna will be face painting via a corner booth at the show; She will also be releasing her brand new board book SillyFace. Lovely Designs for Halloween and Dia De Los Muertos by Ms Anna in the Children's Department at Ralph Lauren. Ms Anna will be painting on the Dance Floor something beautiful and whimsical. Come by to be inspired, meet other creatives, and to dance in a great creative space with other Whimsical souls. Ms Anna's roving Art Cart will be a part of the Renegade Craft Fair this September out on Division St. Be sure to come early to get decorated for one of the premiere craft fairs in the country. Ms Anna will have her cart and will be roving with it. She will most likely end up not far from where she was last year near the food court and photo booth. Ms Anna will be facepainting, will have original art and prints, and will have copies of Everybody Hoops but me available for purchase. Come by to pick up a copy of my first book Everybody Hoops but me... as well as see the original illustrations and pick up other art originals and goodies you won't be able to find anywhere else. Time permitting and space permitting I also offer body painting to the artwalk guests. Ms Anna will be facepainting and will have art, prints, and copies of Everybody Hoops but me available for purchase. FREE Facepainting with Ms Anna Art at select Dunkin Donuts in the Chicago Area. All ages are welcome to come for free facepaint while stocking up on their favorite donuts, coffee, or ice cream. On Chicago Ave between Damen and Wood. Come visit Ms Anna and her art cart for facepainting, prints, and copies of Everybody Hoops but me. Facepainting, Original Art, Everybody Hoops but me Illustrations and Copies of the book. Come to Ms Anna's studio during the artwalk and get decorated while seeing where Anna works! All ages welcome. I will have my cart out front at Kismet and will be facepainting all day on the 4th of July! Come by and get decorated for your parties all you lake people. This event runs from 10am to 5pm on both Saturday and Sunday. This will be my first big fair of the season. I will have a full tent of art and stories and will be offering face painting throughout this two day event. Such a beautiful event I will be apart of this October! Purchase tickets at the link above. 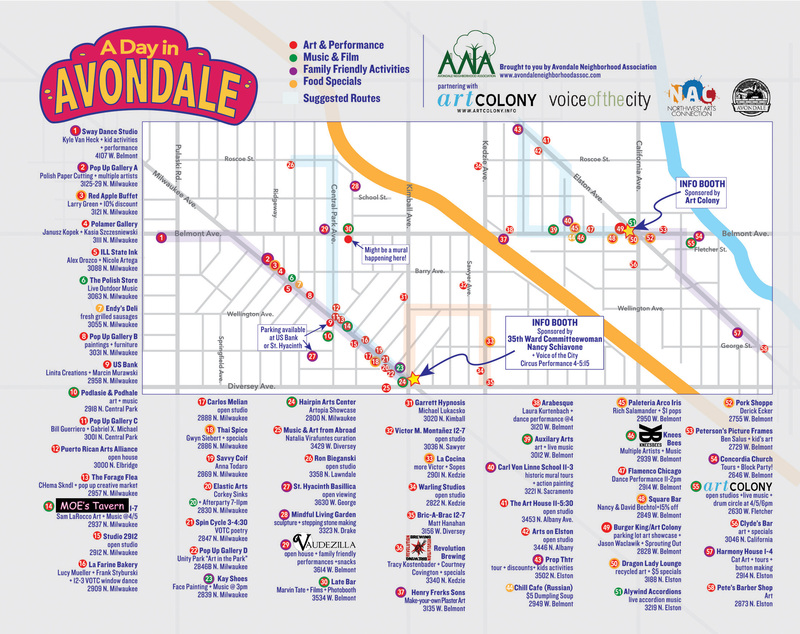 Money from the auction will go to benefit Abraham Mellish Jr.
Over 50 art openings and events line this beautiful Avondale artwalk. The above link is a direct map of the event and all of the things to do and see Saturday along Milwaukee Ave and the surrounding area.